Turn your hobby into your job in music, dance, acting and voice acting industries! Our graduate are highly evaluated by music and entertainment industries. 1. Scholarship in form of reduction and exemption of tuition fees is available for eligible International Students. 2. Our JIKEI COM International Center is an office dedicated to assist each foreign student in various languages such as Mandarin, Korean and English. We will be able to help you through a range of issues, such as curriculum, finding employment, fee consultation, visa, and accommodation and part-time jobs. 4. Our campus is located in Nishi-Kasai and Shibuya respectively. Both places are close to the train stations. This efficient and easy accessible environment makes us the perfect place for studying. 5. Every weekend and holiday, our campus is opened for visitation with school's briefing and trial classes. Please feel free to join us! Individual counseling on weekdays is also accepted. 1. Through our Industry Project, you will be able to get involved in the professional workplace, acquire the practical skills that the industry desires. We have a collection track record of over 1300 companies. 2. Meet each student's dreams and goals, you can also take classes of other courses,「W Major Curriculum」enables you to spread your future possibility. 3. 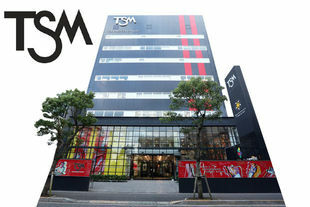 At TSM, we work hand in hand with the industry to develop a system to aid you in your quest for a debut or employment. Our dedicated career counsellor will provide you the support that you need to realise your dream, even after your graduation. 4. Work with professional equipment and settings. We are open 24 hrs(on special days)to provide you with the best support. 5. Dedicated dormitories are available! Even for those living on their own for the first time, we promise to deliver a lifestyle that is convenient, safe, and relaxing in our dormitories to make sure students can study in a peaceful and efficient environment. 6. You are eligible for free medical examination at our partnership Keiseikai Clinic. Such as composing a song for actual artists, there are many programs to gain experience as a professional musician. Unique audition and Joint enterprise briefing will be conducted to support your debut and employment activities. 1. Industry Project: We have collaboration track record with over 1300 companies, so you can learn from professionals in the field of music and entertainment over 200 times, gain the job experiences at the real workplaces, such as concert producing, composition, chorus, backup dancer, acting in animation, drama, film and theatre. Our students will acquire practical skills required for the industry. 2. Double Major: In accordance to your goals, you can also extend your study from other courses. Develop your character, and broaden your horizons. You are able to put your focus on both debut and employment. 3. Debut and Employment System: Our staffs and our strong connection with the industries will help you to make your dreams true. 591 companies attended our Talent Search Presentation and 331 companies attended our Career Fairs, the recruitment staffs came to us and held the our own auditions and interview sessions. In addition, there are more chances to have auditions and internships. Our special staffs aim to provide you with the best and most thorough support for your debut and employment even after graduation. Reduction and exemption amount will vary depending on the course. For further information, please contact the school. ②However, Government-sponsored students are not included. ①Must have an attendance rate of 80% (and above) at your current Japanese Language school/equivalent institution. ②Must score at least N2 for JLPT, 200 and above for EJU and 400 and above for BJT. ③Must pass the Japanese language test of our school or must be clear of your life goal and be motivated. Exemption application fee JPY 30,000 will be waived. ※Closes once maximum capacity is reached.